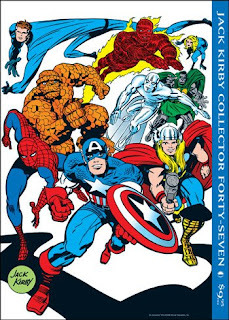 Publisher John Morrows has made a relatively last-minute decision to post a PDF copy of Jack Kirby Collector #48 #47 on the TwoMorrows web site for free this weekend as part of the Free Comic Book Day celebration. It's only this weekend, though, so be sure to get 'em while they're hot! UPDATE: My bad; it's #47, not #48. Still good stuff, though! Does that mean it doesn't have your Machine Man article in it?!? No Machine Man from me in that issue, but my column still does appear, as it does every issue. In #47, I tackled the highly-charged topic of HERBIE the Robot.